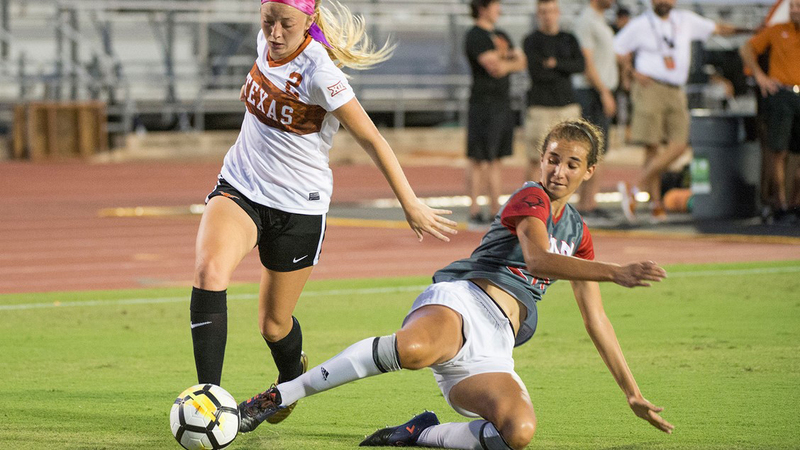 Midfielder Haley Berg led the Texas offense with three shots in a 1-0 loss to West Virginia in the semifinal of the NCAA Championship (photo courtesy of texassports.com). KANSAS CITY, Mo. — No. 14 West Virginia outshot No. 18 Texas, 28-9, and enjoyed a 9-4 edge in shots on goal, and knocked off the Longhorns, 1-0, in the semifinals of the Big 12 Championship semifinals at the Swope Soccer Village. The Longhorns’ second loss to WVU in less than a month left the teams with identical 13-4-3 records. WVU will face Baylor in the Big 12 Championship final, while the Longhorns will await word on a likely NCAA bid which will be unveiled during the annual NCAA Selection Show broadcast through NCAA.com at 3:30 p.m. (central time) Mon., Nov. 5. The Mountaineers got the game’s only goal in the 64th minute, when forward Sh’Nia Gordon gathered a pass from Nadya Gill, split two Texas defenders and buried a shot in the lower right corner of the net. The UT offense was led by midfielder Haley Berg, who had a team-high three shots, and forward Cydney Billups, who added two. Texas goalkeeper Nicole Curry turned aside seven shots in the loss.